The corollary to fewer exhibitors at Chelsea is a little more space to breathe, at least in the Pavilion, if not round the show gardens: fewer means more necks craned round each. A review of Trad’s annual Best Garden Award over many years betrays his partiality for the traditional, the nostalgic….. and specially for fake landscapes; reproductions of far-away or long-ago places. You will, probably rightly, never get the ultimate medal for chunk of seaside or farmland transplanted to Chelsea; modernity is deemed more relevant. How many gardeners actually prefer concrete to rock, or steel to wood, is an unanswered question. This one is still moved by a beautifully-made dry stone wall or stream among wild-flowers, the sort of thing that Mark Gregory created so convincingly this year for Welcome to Yorkshire. But perhaps this is too easy (however expensive) to imagine and bring off. 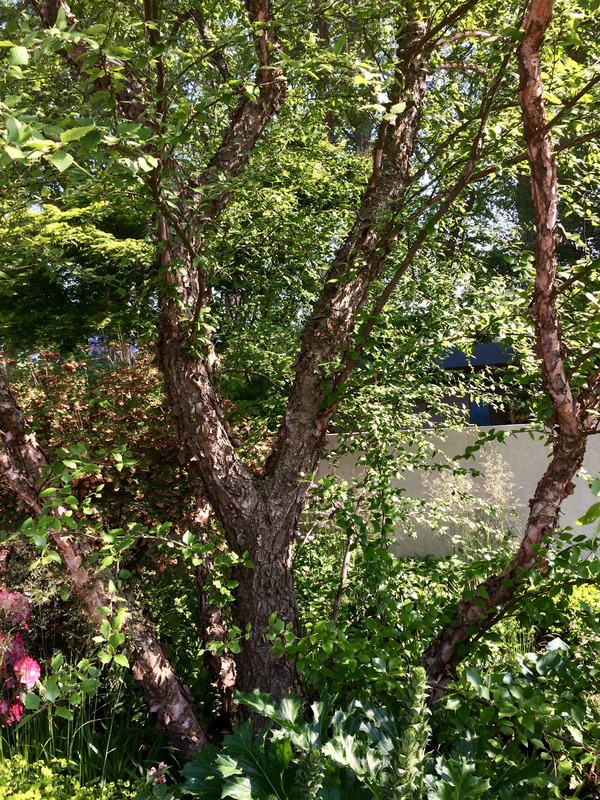 Chris Beardshaw’s garden for the N.S.P.C.C was wonderfully immersive, calm and even mysterious, glimpsed through the five peeling grey trunks of a magnificent River birch, Betula nigra, that travelled, he said, from north Germany, 8 tons of it, swaddled and cradled so that not a leaf was bruised. I see (next day) that it was voted the best by the (other) judges. Several gardens showed off what seems to be an advance in tree-moving technology. On the Monument Stand in the Pavilion Tom Stewart-Smith and Crocus (who seem to have their green thumbprints on half the show) have whisked up a lime tree as tall as the monument itself. They must soon reach the limit to the size of tree you can take by road. You get a long side view of the first site on the Main Avenue, the one that greets you as you arrive. It begs for architecture, and seems to work well with airy evocations of arid sun-baked places. Sarah Price designed such a scene for the main sponsor of the Show, M&G Investments, using stark adobe walls and bright patches of drought-resisting plants with admirable restraint. It was no surprise to see the Crocus signature here, too. Trad has never given a gong to the best nursery stand showing its plants in the Pavilion. There is too much variety, and too much expertise on show to single one out. Besides, it is a matter of taste. Peter Beale’s Roses always draw one across the tent, but so do Raymond Emison’s clematis, Blom’s tulips, Kelway’s peonies, Norfield’s maples, Bowden’s ferns (tree ferns seem to be in fashion this year), Lockyer’s auriculas, and the unfamiliar exotic introductions of the Wynn-Joneses of Crug Farm Plants. And am I deceived in thinking the proportion of plants (and gardens) to infinitely-assorted hardware goes down gradually year by year? 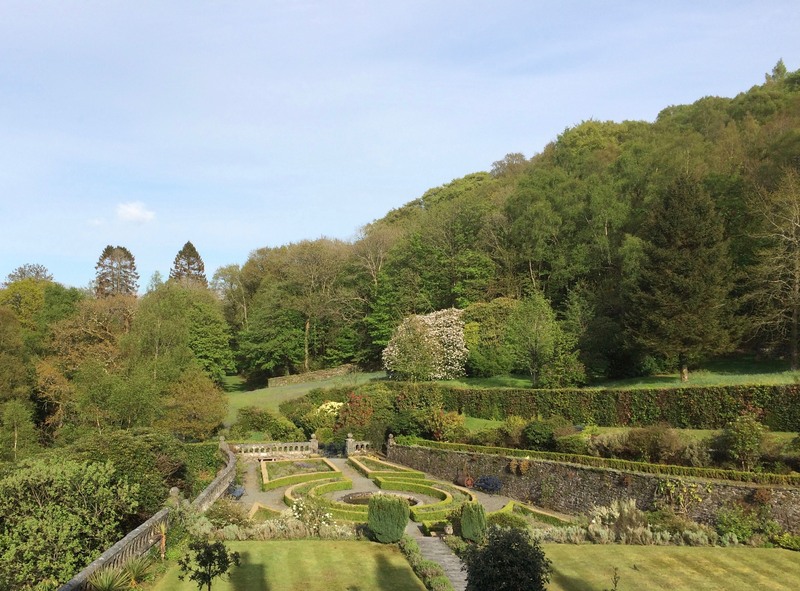 Three years ago, in May 2015, I wrote an entry about staying in a Welsh country house hotel. We’re here again, and everything I wrote is still true. I don’t know any other garden where the tastes and sentiments of a hundred years ago are so perfectly preserved. Benign neglect has done its work. Clearly there were once many more incidents, of structure and planting. Traces of abandoned stone paths wind up the steep slopes under the huge beeches and oaks. Where once there must have been beds of massed azaleas and camellias only the sturdiest have survived, to reach impressive size. Some specimens of Rhododendron arboreum are now forty-foot towers of deep green and bright red. Sheltering under one of them is a pure white camellia, intricately double, now twenty feet across, covered in perfect buttonholes, and across the granite path, plush with moss, the yellow Azalea mollis, and another, a peachy version, have opened up into graceful dancers in the dappled shade. The phantom of an avenue leads straight on from the sunk parterre, rising with the hill from a meadow of bluebells, scattered with old orchard trees and on one side beehives. A wavering stone wall, deep brown and moss-green, divides it from the forest. Above the house the rectangle of what was once the tennis court is now bluebell-spangled, with silver birches in place of netting. A cuckoo speaks above the background burble of streams; the hill is full of them, converging in black rocky channels on a long pond where gunneras are just expanding elephant leaves. There is a secular logic about this garden. It meanders with the contours of a mountain, trying tentatively to impose formal shapes on random slopes. Dark granite balustrades outline what was once formal. A rectangular lawn points away from the house at what seems an awkward angle until you look beyond; it is aimed squarely at the dome of Diffwys, purple or snow-covered, second highest mountain in these parts only to Cader Idris. Time has engineered perfect integration here, of nature on the grand scale and the gardener’s puny interventions. The result is tranquillity. I should have paid more attention when people told me about gardens in Northern Ireland. Three days there with the I.D.S was a revelation. The dendrologists of this world are a coterie of warm-hearted enthusiasts, principally focussed on trees, but distracted in a flash by any beautiful or intriguing plant, forest or garden. Heads down, in other words, as often as up or sideways – and always chattering. A friendlier network you couldn’t meet, or one better-informed about gardens and gardeners to visit. So three days to see the dendrological gardens around Belfast, or more strictly round Strangford Lough, the almost landlocked arm of the sea just north of the city. The best known by far is Mount Stewart, the largely Edwardian playground of the intensely socialite and political Londonderrys. Edith, the marchioness, was famous for her sense of humour, which she embodied in comical statues of animals peopling the walled garden. Perhaps she had in mind the Italian Gardens like Bomarzo adorned with monsters and ogres. Italy had the advantage of artists as designers and skilled stonemasons to cut the figures. Crude caricatures cast in cement long after the laughter has died aren’t quite so persuasive. It was trees we came to see, though, and the woodlands of Mount Stewart were alone worth the journey. It was high rhodo time, and my ignorance of their provenance and parentage was shameful. Himalayan trees brandishing hundreds of huge flowers: arboreum? sinogrande? macabeanum? Better to stay mum and wonder. It’s probably a hybrid in any case. Neil Porteous, in charge of the gardens for the National Trust, knows it all, and far more than he had time to tell us. The Gulf Stream obligingly curls round the north coast of Ireland, through the North Channel, where only 13 miles separates it from the Mull of Kintyre, to rush in and out of Strangford Lough with every tide. As a result the shores of the Lough rarely freeze; the whole shallow basin maintains an equable, damp growth-provoking climate all year round. Castlewellan is a name most gardeners know – if only as a yellow variety of the infamous Leyland cypress. The Annesley family started an arboretum here in the 1840s and time has given it a stature it is hard to beat, with champion specimens by the dozen, many them conifers; not all of them beautiful. We visited Seaforde, where the Forde family have lived for 400 years, in the past century creating a bewilderingly huge and beautiful woodland garden – and now a papillion pavilion, if that’s the word, of tropical butterflies.. Wandering in such museums of forest beauty is hypnotic – and of course deceiving. Nowhere in nature is there anything like the variety, of form and colour, texture and intermingled growth. What you see in a great woodland garden in spring is an invention of the 19thcentury, embellished in the 20th, and perhaps at its very peak in the 21st. Not that it always takes a century to achieve. Paddy and Julie Mackie started their collection on the completely bare Mahee Island (they had gone there as ornithologists) in the 1960s, and it is already richly mature. Their daughter Tracy Hamilton conducted our visit. 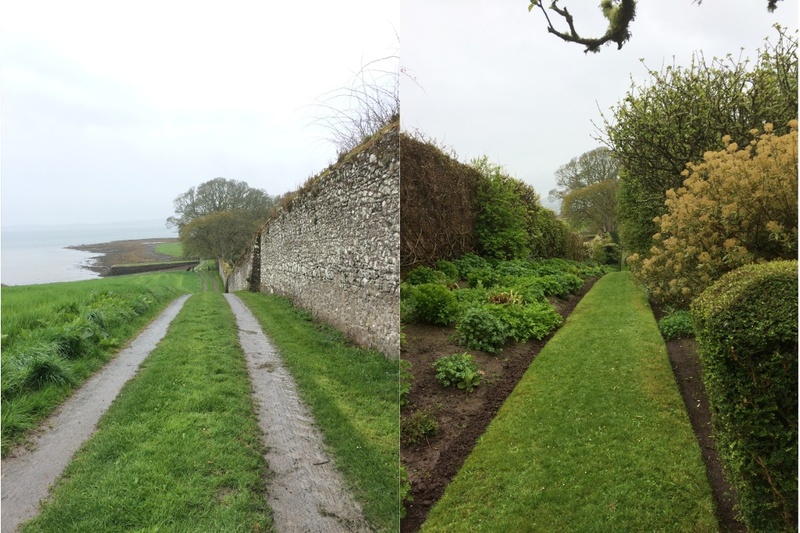 The picture above of her walled garden at Ringdufferin sums up the contrast between the windswept shores of the lough and the sanctuary behind garden walls. Just when we gardeners are cajoling our friends (who are doing likewise) to come and admire our magnolias/camellias/tulips/wisteria the weather turns round to bite us. Is this a rehearsal for the Bank Holiday? Then what was that heatwave at the beginning of May? Plants can’t exactly back-pedal when their spring hopes are dashed. Some can put the brakes on, but once the bracts are off, the petals are on their own. Even the blackthorn has mistimed its winter, the high point of its not very exciting year. It flowered in a warm spell; I wonder how many sloes there’ll be this autumn. My excitement just now is watching and measuring the progress of a newly-planted clematis. C. armandi is remarkably deliberate and predictable. It sends up a leading shoot with two opposite arms at the base, each ending in three leaves curved inward like grappling hooks. When one (or both) finds anything fixed to cling to, one or two of the tender young leaves try to encircle it. When it senses a firm hold the leading shoot has the confidence to extend. If both arms find a purchase they remind me of an athlete hoisting himself on parallel bars; up goes the leader at double speed, to repeat the process. Anything that damages it at this stage seems to discourage the whole shoot, and possibly give a boost to another. The whole thing is a vivid demonstration of hormones in action. Like spring itself. In the old days, with scant regard for the rules, we just called it ‘Japonica’. Scarcely a garden was without this obliging little bush that bursts into bright colours at tulip time. Like forsythia, it is easy to overlook or dismiss as a cliché, yet about the time of the blackthorn winter (a fortnight later, like everything else, this year), long before the azaleas, or its cousins the roses open their flowers, and even on dank north walls, Japonica is up and doing. Chaenomeles is not hard to say, but more important is to remember which variety you have, or would like to have. 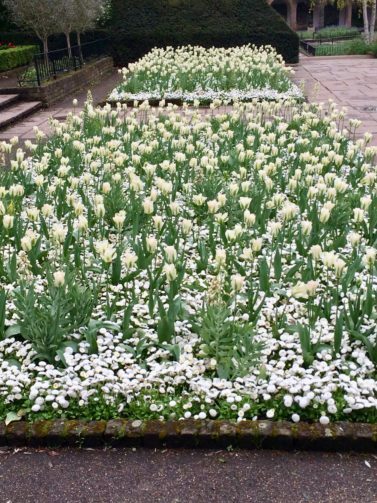 My clear favourite is the pure white “Nivalis”, which also seems, round here, to be the earliest in flower; even this year, in London gardens, performing in late March. There is something touching about its simple five virginal petals spreading wide so soon. The showiest, and I suspect the most popular, are C. Knap Hill Scarlet and Crimson and Gold, both as full-on as tulips in confronting the grey of the end of winter. We inherited the only one I would have chosen not to plant, a rather washed-out tangerine flower which I think is called Cameo. Pastel orange just doesn’t go with anything else in the garden – unless perhaps I were to add Ballerina tulips. Instead I’m trying to offer it some complementary blue. I’m watching a young Clematis alpina inching up into its branches; hoping that will justify its out-of-context orange. Come to think of it, why not Ballerina next year? And for that matter blue Scilla sibirica? Better to make a real point of something than to wish it weren’t there. My Japanese correspondent is writing about Kyoto and Nara, Japan’s most historic and beautiful cities. “(Kyoto) is one big busy theme park; centuries-old temples and shrines being attractions not unlike Sleeping Beauty’s castle. The signs saying ‘No food’, ‘Do not take photos’, ‘Do not step on moss’ are the only way of telling that this is a historic place of worship. Even ‘no drones’. Cambridge is another victim of its own success, recently made more acute by, of all things, a dead poet’s fan club. Xu Zhimo studied at King’s in 1922 and was moved by the beauty of the Backs to write a poem about the Cam, rather better, it must be said, than Rupert Brooke’s The Old Vicarage, Grantchester, written ten years before. Two lines of the poem are inscribed on a white boulder by the bridge and willow he describes, perhaps unfortunately inviting the reader to go punting. He can hardly be blamed for the resulting queues. Chinese students are welcome, of course, but they don’t account for the crowds that at times make King’s Parade a bear garden. Remembering the special flights from Tokyo to Marseille to worship at the shrine of Peter Mayle and A Year in Provence, I dread to think what will happen when China at large starts to apply for tourist visas. Beaulieu Sur Mer is nearly a thousand miles south of London, but it is no more spring here than at home. The precursors, and the excitement, among the limited range of plants that tolerate this extreme climate, are the wisteria, just opening early buds, the irises (and I’ll talk about the purple one in a minute) and the iconic rose of the Côte d’Azur, La Follette. Is there anything to match this precocious outburst of pink petals? There is a pink pigment through the whole plant – its new shoots and opening leaves are a tender pink-green – and a spring time surge of vigour that puts other roses to shame. Its flowers first appear here in mid-March, often high in tall olive trees, sometimes in a sublime combination with the delicate precocious white-flowered broom and later with the early purple buds of wisteria. Often you spot its pure piercing pink blooms displayed naked against an azure sky. It seems such an essential part of the Côte d’Azur that I’ve delved into its history. It takes us straight back to the founder of the Riviera as a resort and a cult, Lord Brougham, Lord Chancellor of England. He discovered the village of Cannes in the 1830s and bought farmland going down to the sea on the Fréjus road, the ancient Via Aurelia, where he built a classical villa. It was the prototype for the thousands that followed; he called it Eléonor-Louise after his daughter, and employed a head gardener, Gilbert Nabonnand, who went on to breed roses, import exotics, and found a famous nursery business on Cap d’Antibes. Nabonnand was succeeded at Villa Eléonor (this is in Brougham’s grandson’s day) by an English – or possibly American – gardener, Jesse Busby. 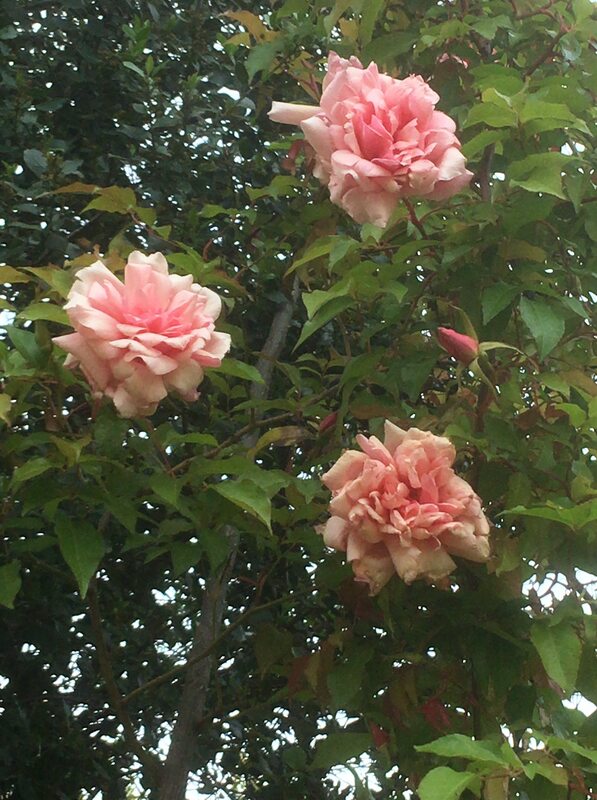 Rose-breeding was still a Brougham passion, and Busby experimented with the monster Chinese Rosa gigantea, introduced (to Lisbon) in the 1880’s, which can produce shoots thirty feet long in a season. In 1910 or so he came up with La Folette (or Follette, or sometimes Sénateur La F.) Could this be have been ‘Fighting Bob Follette’, a radical Republican senator and Governor of Wisconsin, who died in 1925? In which case there are two Fs, and my hunch that Busby was American has some grounds. You can grow it in England if you have the space. Peer Beales lists it. We grew it in the conservatory at Saling Hall and it even tolerated potted life for a few years – though never as well as the sumptuous yellow Maréchal Niel. It has been a success outside in Sussex, and with our weather getting warmer it could be wonderful on a sheltered pergola. The iris is the other treasure of the moment. It is pure deep purple, the whole flower. The local gardeners, Lucien and Pascale, have perfected its cultivation in a metre-wide bed of stony soil on the edge of an old olive terrace, alone, with no other plants of any kind. Every other year they dig it up, divide the tough brown rhizomes and set them back on the unpromising surface. With memorable results.